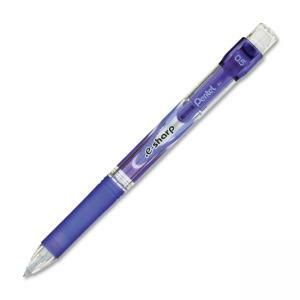 E-Sharp automatic pencil features the Pentel Lead Maximizer mechanism that automatically forwards reserve lead for maximum usage of existing lead. Design includes a large ergonomic barrel and rubber grip for added comfort and control as well as a top click, stationary tip and eraser, and fixed sleeve. Refillable with Pentel's Super Hi-Polymer Lead and PDE-1 large refill eraser.